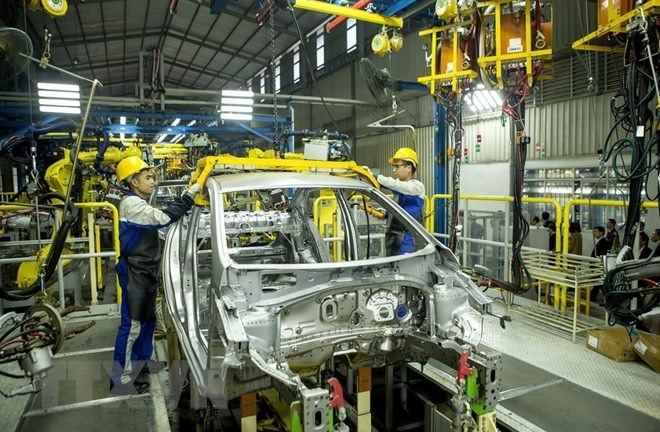 HÀ NỘI — The Ministry of Industry and Trade (MoIT) will implement solutions to support and promote the automobile industry projects of companies such as Trường Hải Automobile Company (Thaco), Thành Công Group, VinFast and others. The ministry will build a pilot part supply chain for automobile manufacturers and assemblers at home and abroad, and study mechanisms and policies to attract investment from multinational corporations investing in large-scale projects in Việt Nam, especially those focused on the brands and models not existing in ASEAN, in order to create conditions for local enterprises to participate deeply in multinational automobile production chains. The ministry will also revise Government Decree No. 111/2015/NĐ-CP dated November 3, 2015 on support industry development to solve existing shortcomings in the portfolio of support industry products which are prioritised for development as well as policies for each sector. An MoIT report showed many major projects of the automobile industry came into operation and many products rolled out to the market in 2018, marking positive contributions to the growth of the whole industry. They included VinFast automobile production complex with total investment of VNĐ35 trillion (US$1.5 billion) and capacity of 500,000 cars per year, Thaco Mazda automobile production plant with total investment capital of VNĐ12 trillion and capacity of 100,000 cars per year, and Hyundai Thành Công automobile factory with total investment capital of VNĐ1.32 trillion and capacity of 40,000 vehicles per year. “The whole industry has been formed and developed by a number of domestic private industry groups with potential to operate in the processing and manufacturing industry, typically in the field of automobile assembly and production are VinGroup, Thaco and Thành Công Group,” the report said.